modern luxury vacation home lake michigan panoramic views with hot tub, fire pit, sleeps 16 with decks and beach and steam shower and gourmet kitchen and ping pong. This spectacular modern home provides a front row seat to the beauty of Lake Michigan. Golden Sunset is a thoughtfully designed magnificent 4700 Sq. Ft. home and is perfect for our guests who are looking for upscale vacationing. Enjoy a home that takes full advantage of the panoramic Lake Michigan views with a main level featuring floor to ceiling windows along the entire west side, a rooftop deck with comfy seating for sunsets and stargazing, lake view decks off of the upper level bedrooms perfect for morning coffee, and a hot tub, grilling, gas fire pit, and dining on the main level lakefront deck. The location of Golden Sunset can't be beat. 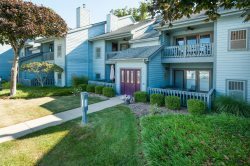 Located only 5-10 minutes from beautiful spacious Lake Michigan beaches at Jean Klock, Tiscornia, and Hagar Beach, the perfect days in this neck of the woods are beach days playing and relaxing in the sand and surf. Also close by are the communities of St. Joseph and South Haven with loads of unique shopping and dynamite dining. Inland a short distance are farm markets, wineries, antiques, and plenty of local charm. Golden Sunset provides truly wonderful spaces for memory making, relaxing, and catching up. The kitchen is fabulous with a large gas range, double oven, sub zero fridge, and a huge island for meal prep and visiting with the cook. The main floor kitchen flows to the dining areas as well as the main living area and the lakefront deck. Enjoy magnificent views and the sound of the waves right outside. The main living room features plenty of seating, a modern gas fireplace, large TV, Music. With 5 bedrooms and 5 baths, plan to bring the whole group because this spacious home offers sleeping for at least 16. Modern beds, nice linens, en suite baths with tubs and jacuzzi and steam, large lake-facing windows with sliders to private decks - this feels like your very own 5 star hotel and spa! The cozy lower level boasts a second large living space perfect for movies and complete with a second gas fireplace. This level has one of the 5 bedrooms with en suite bath as well. The tippy top of this upscale home has a rooftop deck with lounging furniture to get you closer to the star filled nights and the sun filled days. So what if it rains or everyone wants a break from the beach? Well, that's easy. We suggest day trips to South Haven to the North or St. Joseph to the South for shopping, lunch, and great adventures OR head inland to discover farm stands, wineries, and antiques. Or stay at home and play games, play ping pong in the garage, do a movie marathon, or take a nice long bath in the jacuzzi tub. Bedroom 1. Main Level. King and Twin. Bedroom 2. Lower Level. 2 Full. Bedroom 3. Upper Level. King and Twin. Sleeper Sofa. Lower Level. Living Area. Queen. Bathroom 2. Lower Level. Tub/Shower. En Suite Bedroom 2. Bathroom 3. Upper Level. Jacuzzi Tub. Large Shower. En Suite Bedroom 3. Bathroom 4. Upper Level. Tub/Shower. En Suite Bedroom 4. Bathroom 5. Upper Level. Tub/Shower. En Suite Bedroom 5. Large first floor and basement. Every bedroom has a full bathroom. All rooms are clean and well furnished. 200 stairs to the beach are fairly steep/uneven.